IMG_4529, originally uploaded by Titoxd. Well, you don't typically see this often. A rather powerful upper-level low produced widespread precipitation across the Southwest yesterday, and the Arctic air mass behind the frontal boundary pushed the snow/rain boundary over the Valley of the Sun. With snow levels as low as 2,000 feet, we saw snow in the northern areas of the Valley, and even a few flurries on the valley floors. 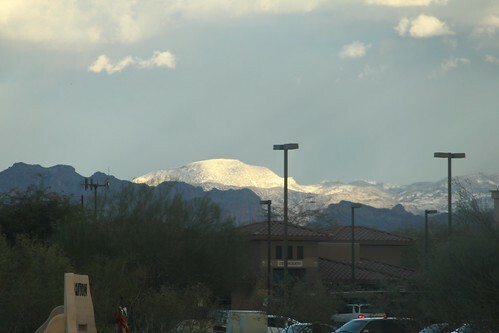 To the northeast, significant accumulations occurred, and they were visible from the East Valley. So yes, it did snow in hell. Will pigs fly next?